After many months without food aid, tens of thousands of people walk to receive humanitarian distribution in 2015. Many starved after the remote wetlands of South Sudan were blocked due to fighting and the rainy season. In 2011, South Sudan declared its independence from Sudan and became the world’s newest country. Celebrations were short-lived: In 2013, a power struggle between the president, Salva Kiir, and the vice president, Riek Machar, exploded into civil war. The violence engulfed the capital of Juba and traveled 400 miles north to Leer. Expecting it would reach them, William and Margaret hurried to get married. “It’s better to have a wife so you can run together,” reasoned William. Elsewhere in South Sudan, a water scarcity leads to disease and desperate measures. Sudan’s largest block of oil. “Some of the last great wilderness is in South Sudan,” says Paul Elkan, who runs the Wildlife Conservation Society (WCS), the only active conservation NGO doing scientific research in South Sudan. Until recently, the presence of large-scale wildlife in the Sudd was so anecdotal, it was thought to be a rumor. After independence Elkan prepared an aerial survey, lobbied for new environmental protection laws, and drummed up interest from tourism companies. Fighting in 2013 derailed all these plans. Without a UNESCO designation and the resulting international pressure, Bior Kwer Bior, the Nile Institute’s founder, believes the Sudd will be destroyed. “Our government is too weak to enforce the law it has,” he says. “No oil company is so humanitarian they would do the right thing unless someone is telling them to.” Recently, the government’s oil minister told companies to begin drilling or their contracts would be canceled. 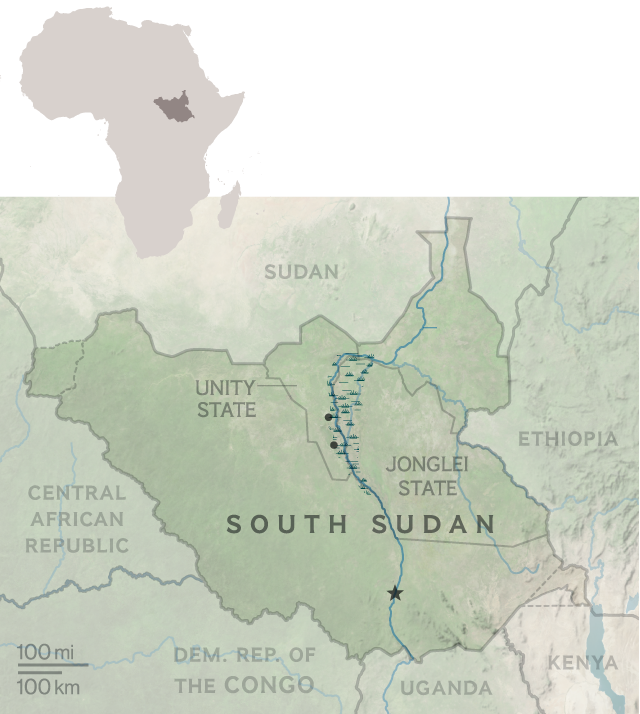 Oil companies weren’t the only ones deterred by South Sudan’s long wars. In 2007, Paul Elkan flew over the Sudd in the first survey after a 22-year civil war and discovered that the 1.2-million-strong migrating herd of antelope had managed to survive. Conservationists theorized that fighting had kept poachers away. A food relief helicopter kicks up dust taking off near Kok Island, which hosts thousands of displaced people in the Sudd. But with the threat of oil exploration, it could be placed on a sublist: the World Heritage in Danger list consists of 48 threatened sites that receive special funding and attention. When the Taliban blew up the enormous Buddhas carved into the mountainside of Afghanistan in 2001, the Bamiyan Valley area was ushered onto the list. In 2015, sites in Iraq and Yemen were added. South Sudan’s neighbor, the Democratic Republic of the Congo, has listed four of its seven national parks.